In this course we will learn how to use various stretches safely, and we will learn how to use Deep Bodywork®, created by Perry Holloman, as a method that integrates the qualities of a flowing Esalen Massage with the therapeutic effectiveness of deep tissue work into an overall session. The workshop will also serve as a refresher for basic Esalen Massage techniques such as the long stroke, but will then explore more in-depth strokes and bodywork techniques. We will support our explorations with several practices like meditation, yoga and other movement disciplines to experience the qualities of awareness and flowing presence central to this method. 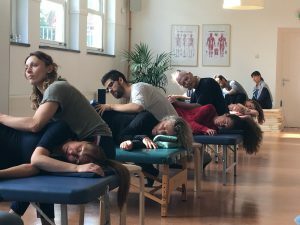 When you are inspired by the spirit and beauty of this work, and want to continue your training, we are very happy to announce that we are working on a official Esalen Massage® Certification Training (23 days) at our venue in Amsterdam! The class will be divided in two modules. Module I from July 6-19 2020, Module 2 from October 10-18 2020. More information will follow.